Bardahl Yamaha’s Randy Krummenacher bagged top spot in Superpole in the middleweight class, but like the WorldSBK Superpole session before it, WorldSSP qualifying was halted early. This time an undetected oil leak from Lucas Mahias’s Kawasaki saw riders falling as they reached Turn 14 and the session was halted. It was restarted, eventually, but after a short fall of snow during the interruption, and then spots of rain all around the track more heavily once they took to the track again, none of the top riders were going to improve their best lap times. Federico Caricasulo (BARDAHL Evan Bros. WorldSSP Yamaha) was second, with the lead MV of Raffaele De Rosa (MV Agusta Reparto Corse) third. In fourth place Hannes Soomer (MPM WILSport Racedays Honda) was top Honda and well in the mix in this session. Despite being one of those to crash on his team-mate’s oil, Hikari Okubo (Kawasaki Puccetti Racing) was fifth in Superpole, with championship challenger Jules Cluzel (GMT94 Yamaha) the final rider on the second row, in sixth place. 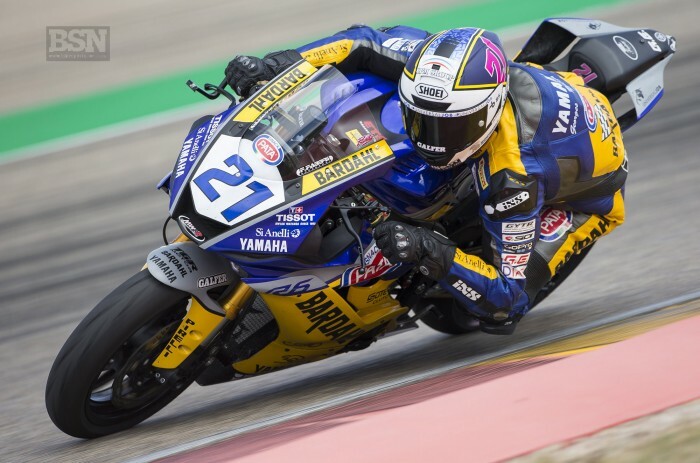 Thomas Gradinger (Kallio Racing Yamaha) was seventh, the stricken Mahias eighth, Corentin Perolari (GMT94 Yamaha) ninth and Isaac Vinales (Kallio Racing Yamaha) tenth. Rob Hartog (Team Hartog Against Cancer Kawasaki) was top local rider, in 12th, one place behind Ayrton Badovini (Team Pedercini Racing Kawasaki). Top ESS rider Kyle Smith (Team Pedercini Racing Kawasaki) was 16th.